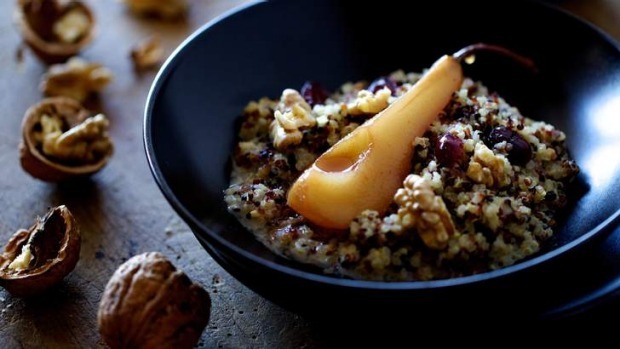 Quinoa porridge is a high-protein, gluten-free and low-GI alternative to other breakfasts and is appearing on more and more cafe menus to accommodate those who want a wheat-free start to the day that's healthier than thou. For the fruit, try poached pears, grated apple, dates, prunes, bananas or berries. For the nuts, try walnuts, pistachios or almonds, and add a handful of sunflower or pumpkin seeds for extra goodness. 1. Rinse the quinoa well in cold, running water, as you would rice. 2. Combine with 350 millilitres of water and simmer for 10 to 12 minutes or until tender, when the little white ''tails'' appear. Drain off any excess water, and return to the pan. 3. Add the milk, vanilla, cinnamon, dried fruit and honey or sugar to taste and simmer gently for five minutes. 4. Top with fresh, raw or poached fruits, nuts and seeds, and serve. Tips: Look for white quinoa or a mix of red, white and black at supermarkets and health-food stores. Always rinse the seeds in cold water first, to remove their natural coating of saponin, which can be bitter. Some quinoa needs a quick soak as well, so read the label.